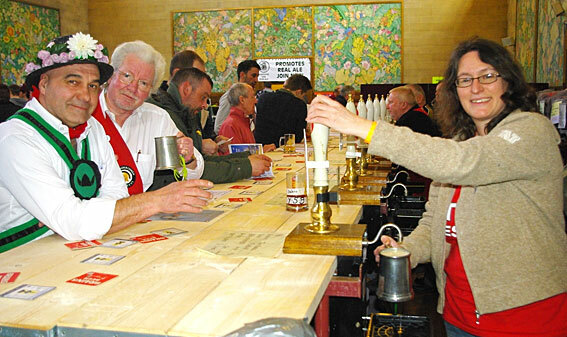 Swansea Camra’s annual beer and cider festival takes place at the Brangwyn Hall, St Helens Road, from Thursday, 21st – Saturday, 23rd August 2014. Opening times are: Thursday – 5pm to 11pm; Friday and Saturday – 12 noon to 11pm. An exciting line-up of more than 100 real ales and 60 ciders and perries from all over the UK will be available. For full details of our beer list, click here. For the cider and perry list, click here. We’ve installed a new cooling system on the cider bar, so ALL our drinks are cooled this year. No more warm ciders! Tickets will be available on the door at a cost of £3 for Camra members and £5 for non-Camra. The admission price includes a souvenir glass and programme. Please note that only people over the age of 18 will be admitted. The event is taking place in the beautiful Brangwyn Hall, which is looking even more amazing this year after a major refurbishment. For a map of the hall layout, showing where you can find each bar, click here. As well as sampling the brews, you can also enjoy live music every afternoon and evening or take part in one our new programme of fringe events, which include tastings and talks. For full details of the entertainment programme, click here. We also have new caterers this year who will be providing a tasty menu of hot and cold food with locally sourced ingredients. You can check out Merry Berry Truffles too, who specialise in matching chocolate and beers. This year we are welcoming Tiny Rebel to the festival, who are joining us as main sponsors alongside our longstanding partners, Brains. Visitors to the festival will have the opportunity to meet owners Brad and Gareth, either on their bar or at their “Meet the Brewer” session on Saturday afternoon. We’ve also had support and contributions from others, including Tomos Watkin, Gower Ales and the Pilot in Mumbles. The festival is entirely run by volunteers, who give up their time to share their passion for real ales and ciders. They do this because they enjoy it, and we believe this helps you to enjoy a great and friendly atmosphere. In celebration of this year’s Dylan Thomas centenary, the Lighthouse Theatre Company will be doing a session of readings from their entertaining “Poems & Pints” repertoire on Friday afternoon. Brains have also supplied their Organ Morgan golden ale, named after the famous character from “Under Milk Wood”. ‘I liked the taste of beer, its live white lather, its brass-bright depths.’ Dylan Thomas.